Ready for a LARGE game of hoops? Head to Head Monster Basketball is just what you need! Both hoops are 8' tall and you get 4 giant basketballs (2 each of 24'' and 37'' basketballs). 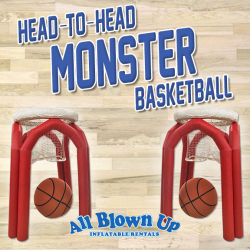 This full-court game will make any party, carnival or BBQ a HUGE success!